Historically, insects have caused many problems for humans. In addition to the spread of insect-borne disease, and the part they played in spreading the plague, insects have also been known to kill with their venomous bites and stings, albeit rarely. Sometimes mysterious physical conditions are blamed on insects, even when no evidence of an insect culprit exists. For example, in Italy during the 1800s, wolf spider bites were blamed for causing people to dance about while in hysterical trances. Italy is not the only place where ridiculous arthropod-related myths have taken shape. During the late nineteenth century, many Americans panicked over a purported epidemic of kissing bug bites. What was odd about this supposed “epidemic” was the fact that those people that reported sustaining the bites never actually saw the insect culprits. At the time, it was believed that the kissing bugs snuck up on their sleeping victims only to escape unseen after inflicting their bites. These bugs earned their common name from the false belief that they focused on biting people’s upper lip. One newspaper database came up with more than fourteen hundred results for kissing bugs in just 1899 alone, which is when the kissing bug panic occurred in the US. One newspaper article printed in June of 1899 described the numerous kissing bug “attacks” that had been occurring in Washington DC, as well as in areas along the eastern seaboard. The article claimed that numerous kissing bug victims reported to the hospital after being awoken by their bites in the middle of the night. Many of these victims were reported as having developed severely swollen upper lips as a result of the bites. In each case, the victims did not actually see the bugs on account of their speedy getaways after inflicting their bites. 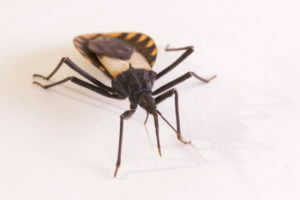 These stories were heavily reported by the media, which resulted in nationwide searches for the mystery kissing bug. However, by August of 1899, the kissing bug phenomenon was dismissed as a hoax in many newspapers. Do you think that modern Americans could become panicked over a hoax involving the spread of exotic and dangerous insects?